The next two heroes from the Uprising Hero Pack join the fray! Welcome back to another Guardians preview! New heroes are emerging to join the fight for the future, and we’ve got a sneak peak at them right here! Last week we explored the abilities and a few of the cards for Chamber and Pandora. Each hero brings their own unique flavor and flash to their team, so choosing the right combination is crucial for success! 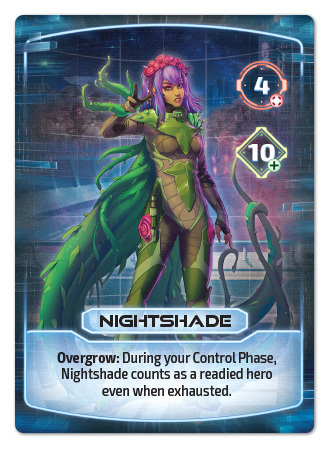 Today, we’ll be looking at the next two heroes from the Uprising Hero Pack: Atrivoxx and Nightshade. Let’s start off with the Master of Charge himself! 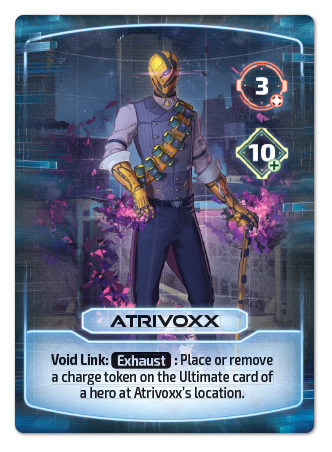 Atrivoxx is the second hero in this pack to have an exhaust ability, and boy is it a powerful one. Using Void Link, players can either slow down enemy ultimates or fast track their own! 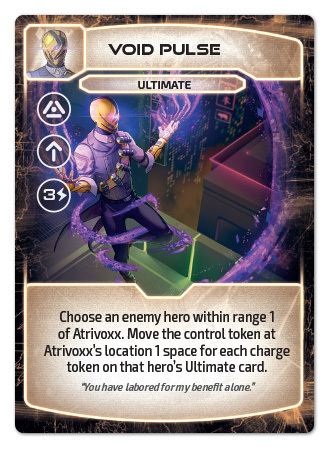 Charge manipulation is the name of the game with Atrivoxx. Many of his cards have to do with the use of charge tokens on both friendly and enemy heroes. 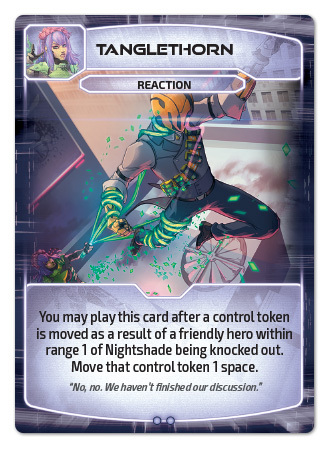 For example, Void Shock hits for four damage, which is higher than most action cards, but it also gives your opponent a charge token to place. 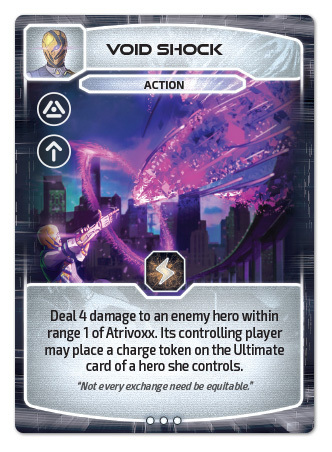 For some heroes that might be a dangerous trade off, but Atrivoxx actually benefits from it quite strongly with Void Pulse. This ultimate card actually wants an opponent to have plenty of charge! As a reaction, Tanglethorn limits the benefit players see from knocking out a hero within range 1 of Nightshade. Given how close fights for locations re in Guardians, this one space can make a huge difference for your opponent’s plans! 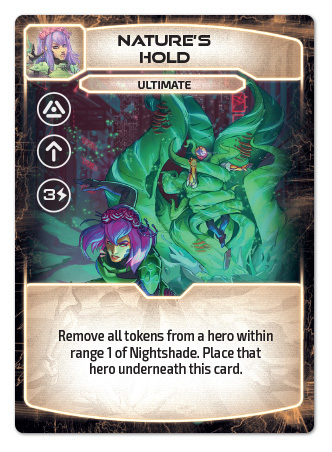 Nature’s Hold is another card that is aimed at disrupting your foe. You’ll notice this card effectively removes a hero from the board! Don’t panic, though. 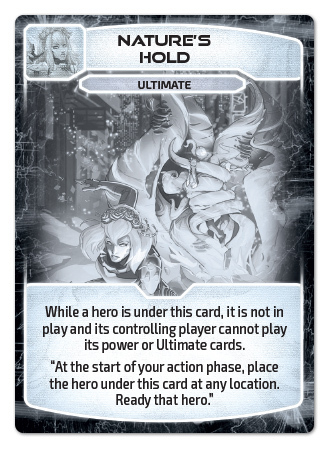 The hero comes back as explained by the card’s reverse side below. For one round, a player will effectively be down a hero, which can give your team the time it needs to push for the win. You may also notice that Nature’s Hold doesn’t knock out the targeted hero or specify that it needs to be an enemy hero. That’s because this card can actually be used defensively as well. Target your own heavily damaged hero and remove all damage from them, denying your opponent a crucial knock out! That’s all for the first hero pack of Guardians! We hope you’re excited to add these four heroes to your collection and to start finding your new favorite teams! Remember, Guardians is available for purchase now from retailers and our own web store, and you can still preorder the Uprising hero pack here!